Just listed in Stuart within the ultra-prestigious community of Port Sewall Harbour and Tennis Club is this stunning Mediterranean estate on an acre of land. Offering 4 bedrooms and 4.5 bathrooms, this Port Sewall Harbour and Tennis Club beauty features a panorama of sparkling water views throughout its 4,746 square feet of designer appointed living space. The graciously proportioned floor plan reveals an array of luxurious features including a fully equipped chef’s dream kitchen with beautiful custom cabinetry and a full suite of high-end appliances, floor to ceiling high glass windows with stellar water views throughout, a spacious Master bedroom with beautiful sitting area, a luxurious master bathroom with roman sunken tub and separate shower. There is a boat dock with a convenient boat lift. The phenomenal outdoor pool has breath taking views of the scenic waterway. This gem is equipped with an elevator and a wood burning fireplace. 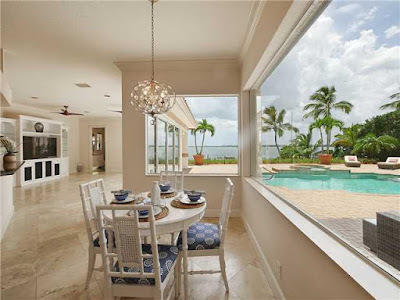 3984 SE Old Saint Lucie Boulevard is located in Stuart and is currently asking $2,399,000. This Port Sewall Harbour listing is courtesy Premier Realty Group of MLS# TX-383431. Port Sewall Harbour and Tennis Club is an desirable boating and tennis community in Stuart, Florida. The residences at Port Sewall Harbour and Tennis Club have unparalleled tennis courts. A five star clubhouse with a pool awaits the residents. Located just east of St. Lucie Boulevard residents of Port Sewall Harbour and Tennis Club enjoy fine shopping and dining in downtown Stuart.